(a) Lock the hose clamp, as shown in the illustration. (b) Disconnect the heater inlet water hose. 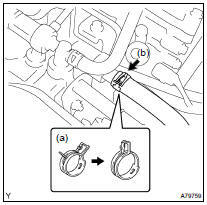 (a) Disconnect the camshaft timing oil control valve connector. (b) Remove the nut and disconnect the engine wire harness clamp. (c) Using a socket hexagon wrench 8, remove the hexagon bolt. (d) Uniformly loosen the 8 cylinder head bolts in the sequence shown in the illustration. Remove the 8 cylinder head bolts and plate washers. Be careful not to drop the washers into the cylinder head. To avoid damage to the gasket, place the cylinder head on the gasket carefully. Torque: 19 NVm (194 kgfVcm, 14 ftVlbf) (h) Connect the engine wire harness clamp with the nut.